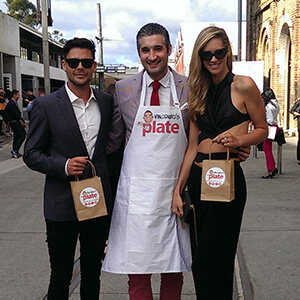 Earlier this year, Luca Bronzino and I were very excited to head to Mercedes Benz Fashion Week Sydney, to deliver Vincenzo’s Plate goody bags to beautiful models, stylists and bloggers. Whenever you go to an event or a show, you always leave with a goody bag, but not very often do you find homemade goodies inside! 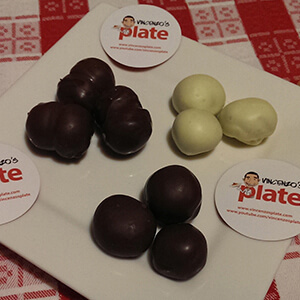 So I decided that even though people who are in fashion are always worried about what they eat, they would need a sweet while running between shows and who can resist me and my delicious chocolate balls….haha – yum!! Luca is also from Italy and we both like to dress up so we showed up in style and introduced lots of people looking for fashion to Vincenzo’s Plate! 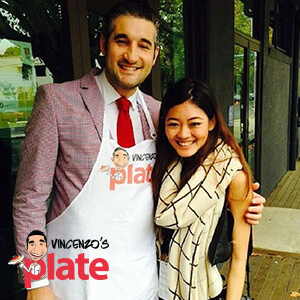 Luca was wearing an amazing charcoal Pal Zileri suit, black loafers, a white shirt and red tie, and I wore red pants, a check jacket, white shirt, red skinny tie, brown shoes and my Vincenzo’s Plate apron (of course!). When we got to Fashion Week Sydney the security guard didn’t let us in even though we were dressed really well! He basically said I couldn’t go in because of a conflict of interest with other brands that had paid to be there, but I told him that we weren’t selling anything and that my chocolate biscuits would have been perfect with the Lavazza and Vittoria coffee being served. He still didn’t let me in and then, he asked me to move 200metres away…I was really disappointed and tried to explain that bloggers like Gary Pepper, Nikki Phillips, Dane Rumble and Bam it’s Joanne were expecting me and my sweet chocolate treats! I then moved away from the entrance ofn Fashion Week Sydney and the council inspector came to me asking me if they could have a biscuit, which was hilarious! First they wanted me to leave, then they wanted to try my biscuits! 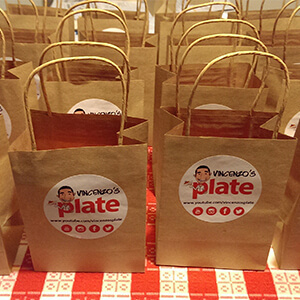 I kindly gave them 2 Vincenzo’s Plate goody bags and with a big smile said “Enjoy guys”. Not long after that, I ended up sneaking into the main hall and delivered my sweet treats to great bloggers such as Bam it’s Joanne, Nikki Phillips and Dane Rumble who were all invited to the shows. The best part is, no one stopped me to go in. Probably the security really enjoyed my biscuits and understood that I am unique and deserved to be part of Sydney Fashion week! Thanks to Luca Bronzino for helping me hand out all the goody bags and to the amazing biscuits for making that positive day at fashion week Sydney possible, it was great to meet so many talented people. If you like fashion, you can click on any of the names of people I met at Fashion week above and check out their blogs! See you in my next video recipe!